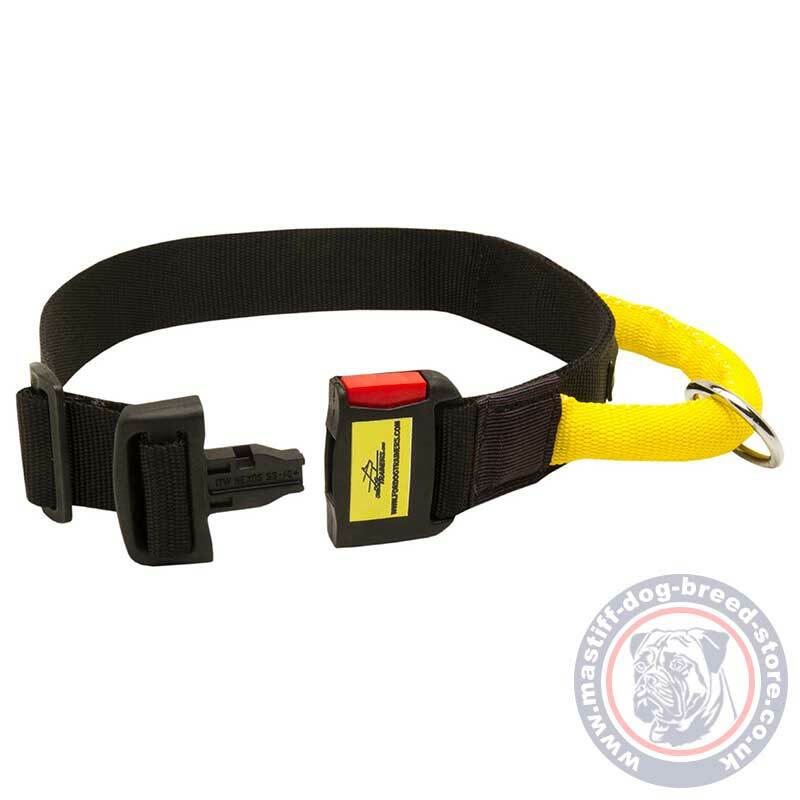 Nylon Dog Collar with Handle and Quick Release Buckle for Easy Mastiff Training and Contol! Nylon dog collar with handle is the best choice to control the power of a large dog like mastiff. This nylon dog collar is the best choice of our customers, one of the favorite collars for mastiff training and walking, control in any conditions and situations. 2 ply, super reliable, equipped with handle and quick release buckle, this nylon dog collar includes all the best features of a dog collar for many purposes. Use this nylon dog collar to make dog walking calm and control obedience of your dog. Nylon dog collar with handle is a good help to handle mastiff temperament and strength. 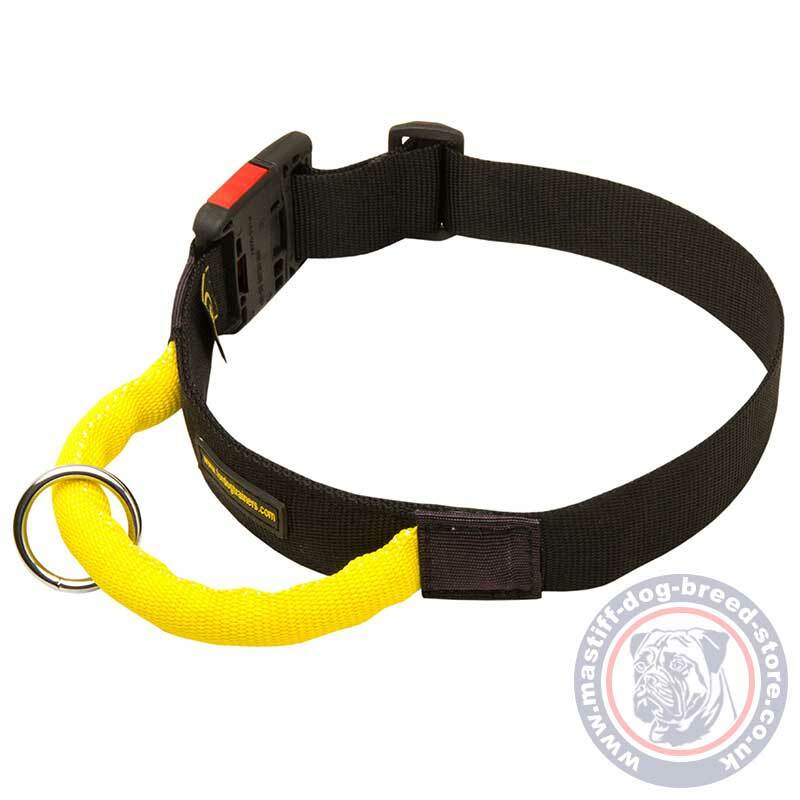 Mastiff dog collar has cast ring on handle for lead attachment. Mastiff training dog collar with handle is produced in three sizes. Each size has a definite limit of length to be fixed on the neck of your dog with maximal comfort. Adjust dog collar length on your dog with the help of an easy clip. Choose this super strong, easy and reliable in use, easy washed and dried dog collar for mastiff and enjoy calm, pleasant dog walking and efficient mastiff training!